Marsden is a large village within the Metropolitan Borough of Kirklees district, in West Yorkshire, England. 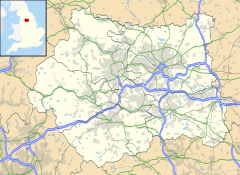 It is 7 miles (11 km) west of Huddersfield and located at the confluence of the River Colne and the Wessenden Brook. It was an important centre for the production of woollen cloth, focused at Bank Bottom Mill, which closed in 2003. According to a 2008 mid-year estimate the village has a population of 4,440. Marsden grew wealthy in the 19th century from the production of woollen cloth. It is still home to Bank Bottom Mill, later known as Marsden Mill, and home to John Edward Crowther Ltd, formerly one of the largest mills in Yorkshire. The Crowthers moved to Marsden in 1876, beginning a long and profitable association with cloth manufacturing in the town. During the 1930s Bank Bottom Mill covered an area of 14 acres, employed 680 looms, and provided employment for 1,900 workers. The Church of St Bartholomew was completed in 1899, although the nave and aisle had been in use from 1895, when the previous chapel was demolished. The tower was built in 1911, and the Parochial Hall in 1924 (with an extension in 1978). The church has a peal of ten bells. Production of woollen cloth at Bank Bottom Mill ceased in 2003, with the loss of 244 jobs. Marsden is the last significant settlement on the West Yorkshire side of the Standedge Pennine crossing into Greater Manchester. The village is in the South Pennines with the boundary of the Peak District National Park to the south. It is surrounded on three sides by the moorland of Marsden and Meltham Moors with Saddleworth Moor nearby. Marsden has low level access only from the east along the Colne Valley. The Marsden Moor Estate, which surrounds Marsden to the west and south, includes several reservoirs, and is in the care of the National Trust. The trust is developing techniques to rehabilitate the moor. Butterley Reservoir with its distinctive spillway is near Marsden inside the Peak District National Park. In chronostratigraphy, the British sub-stage of the Carboniferous period, the Marsdenian derives its name from Marsden. Several generations of tracks and roads have crossed the moors near Marsden. Mellor Bridge by the church, and Close Gate Bridge at the edge of the moor to the east of the village are both packhorse bridges. The A62 road between Huddersfield and Oldham passes through the village and the Standedge cutting some 2.5 miles (4 km) to the west. The road between Oldham and Huddersfield, in particular the stretch between Marsden and Diggle was named the fourth dangerous road in Britain in 2003-2005. First West Yorkshire operates bus services between Huddersfield and Marsden. A local service run by JRT, runs around the Marsden area, before continuing to Slaithwaite. A Trans-Pennine service between Huddersfield and Manchester, jointly operated by First Greater Manchester and First West Yorkshire, passes through the village. Until 1963 it was a Huddersfield trolleybus terminus. The Huddersfield Narrow Canal and the Huddersfield to Manchester railway enter the parallel rail and canal Standedge Tunnels about half a mile (0.8 km) to the west of the town centre. Marsden railway station on the Huddersfield line is operated by Northern provides services to Huddersfield, Manchester Piccadilly railway station and Leeds. The Holme Valley Mountain Rescue Team has its headquarters at Marsden Fire Station from where the volunteer team provides rescue cover for surrounding moorland areas and assists West Yorkshire Police with searches for missing people. The team was founded in 1965 and was based in Meltham before relocating in 2005. Marsden football club, Marsden AFC, play their home matches at the Fall Lane ground. In its centenary year the 1st team were promoted from the West Riding County Amateur League Division 1, and played in the West Riding County Amateur Premier Division for the 2008–09 season. Above the village at Hemplow, on Mount Road is a sports ground that hosts Marsden's cricket, golf and tennis clubs, as well as Hemplow Bowling Club. The cricket club, formed in 1865, runs two teams in the Drake's Huddersfield Cricket League and teams in five age groups in the Huddersfield Junior Cricket League. In 2010 Marsden gained Walkers are Welcome status in recognition of its well-maintained footpaths, facilities and information for walkers and ramblers. Marsden Silver Prize Band is the local silver band. The village hosts festivals and cultural events throughout the year. Marsden Cuckoo Day, a day-long festival held annually in Spring (April), holds clog dancing, a duck race, music, a procession and a "cuckoo walk". The Marsden Jazz Festival is held every October, and the winter Imbolc Festival, in which the 'triumph of the Green Man' (who represents the coming spring), over Jack Frost (the winter) is celebrated with fire juggling and giant puppets. Marsden is the home of Mikron Theatre Company, the world's only professional theatre company to tour by Narrowboat. "Many years ago the people of Marsden were aware that when the cuckoo arrived, so did the Spring and sunshine. They tried to keep Spring forever, by building a tower around the Cuckoo. Unfortunately, as the last stones were about to be laid, away flew the cuckoo. If only they'd built the tower one layer higher. As the legend says, it 'were nobbut just wun course too low'." Marsden was the birthplace of Henrietta Thompson, the mother of General James Wolfe who took Quebec from the French in 1759. Marsden is also where Enoch Taylor was buried. Enoch Taylor was the blacksmith who built the first automatic croppers. The name Enoch was used for the hammers that the Luddites used to smash them. The Luddites used the slogan "Enoch made them, and Enoch shall break them." Simon Armitage, born 1963, poet and playwright. Samuel Laycock, 1826–1893, dialect poet. ^ "Church and Chapel in Marsden". Marsden Local History Group. Archived from the original on 19 February 2007. Retrieved 11 January 2007. ^ "Butterley Spillway, Marsden". Victorian Society. ^ "Britain's most dangerous roads". BBC News. 25 June 2007. ^ "Marsden CC, Yorkshire". marsden.play-cricket.com. ^ "HJCL - Sellers Huddersfield Junior Cricket League". www.hjcl.org.uk. Retrieved 13 March 2017. ^ "Marsden". Walkers are Welcome. Retrieved 24 October 2013. ^ "Marsden Band - General news for Entertainers". www.marsden-band.co.uk. ^ "Night of fire and fun as Imbolc festival returns to Marsden". Huddersfield Daily Examiner. 9 February 2009. Retrieved 9 February 2009. ^ "Marsden Cuckoo Festival preview". The Huddersfield Daily Examiner. Trinity Mirror North West and North Wales Limited. 22 April 2010. Retrieved 24 October 2013. ^ "BBC Radio 4 - Open Country". BBC. Retrieved 24 October 2013. ^ "Luddites". Marsden History Group. Archived from the original on 26 March 2012. Retrieved 30 December 2007. Wikivoyage has a travel guide for Marsden. Marsden Local History Group web site.